Sellers whose homes aren’t in tip-top shape may need to spend extra money or put in a little elbow grease to get their properties in market ready condition. 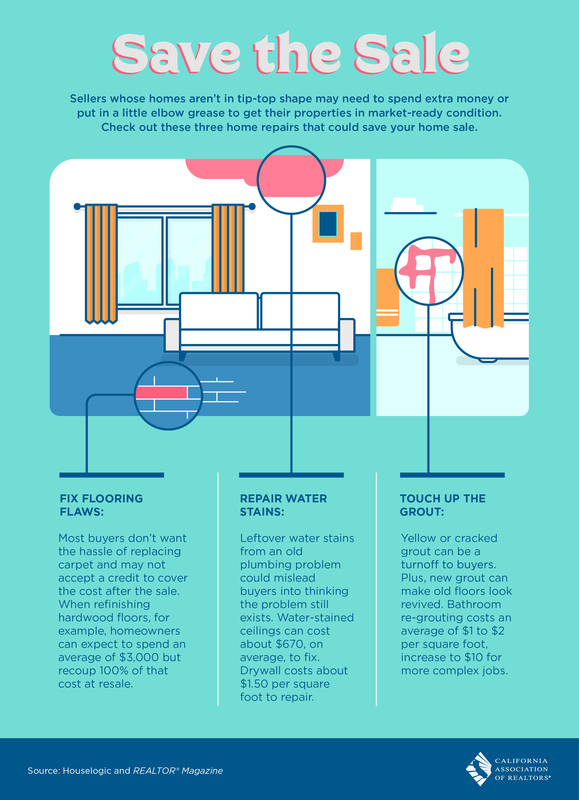 Check out these three home repairs that could save your home sale. Most buyers don’t want the hassle of replacing carpet and may not accept a credit to cover the cost after the sale. When refinishing hardwood floors, for example, homeowners can expect to spend an average of $3,000 but recoup 100% of that cost at resale. Leftover water stains from an old plumbing problem could mislead buyers into thinking the problem still exists. Water-stained ceilings can cost about $670, on average, to fix Drywall costs about $1.50 per square foot to repair. Yellow or cracked grout can be a turnoff to buyers. Plus, new grout can make old floors look revived. Bathroom re-grouting costs an average of $1 to $2 per square foot, increase to $10 for more complex jobs.